I am the worst kind of horror junkie. Since my 5th grade exposure to the first, and only one worth mentioning in my opinion, A Nightmare on Elm Street, I've been hooked. King is my favorite author and I've seen pretty much every slasher/horror movie ever made. Even the ridiculous B-horror flix hold a special place in my heart. So, I'm a sicko, which is important for you to know in order to understand my perspective and how desensitized I am. That way, when I talk about how gory and terror-rific Off Season is, you know it is coming from a guy that giggled during The Texas Chainsaw Massacre and literally ate a plate of spaghetti during Saw. 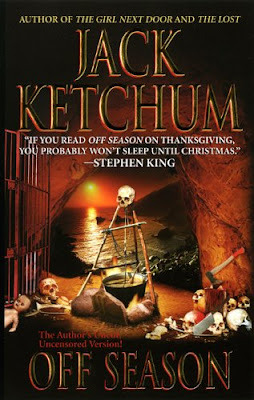 Off Season is written by Jack Ketchum and was recommended to me by a friend because he noticed an endorsement on the cover from "The Master", Stephen King. I had no prior knowledge of the author or book, so when the gut wrenching horrors began to unfold about a hundred pages in, I was surprised to say the least. Jack Ketchum has the uncanny ability to describe acts horrific enough to make Satan weep. Basically the storyline seems contrived with a group of friends visiting a cabin out in the middle of nowhere. Unbeknownst to them, a band of inbred cannibals happens to be living in cave nearby. They are and have been segregated from society and live a savage lifestyle unencumbered by thought, feeling, or societal constraints. Sounds pretty nice in that regard. The group of friends fall victim to these "hunters" who not only see their prey as food, but also entertainment. There are some torturous exchanges that will never leave your mind and some imagery that will haunt your soul. As common as this theme happens to be amongst those entrenched in the horror genre, this book works well. The cannibals are reduced to the most basic animals seeking instant gratification in various forms throughout the book. Complete liberation from society comes with some costs. Their communication remains in the form of grunts and gestures and the raring of their children makes Britney seem like mother of the year and Speaker of House. The main characters are relatable, save the cannibals, and you want them to prevail. As for the other elements to a good horror story, I’ll quote Alfred Hitchcock. He noted that the key to his work was suspense. For instance, you could have a bomb sitting under a table where people are playing cards. The audience sees the bomb and the casual players that have no idea that they are about to become kibble. The card game goes on and the audience is on edge but the most important part of this scenario, however, is that the bomb can never go off. That was Hitchcock’s vision of suspense. Jack Ketchum has no such vision. The bomb will go off, shred the people, who happen to be a young family...who just finished volunteering at the hospital for sick kids...after donating their car to a homeless man they just met. None of them would die quickly from the blast and then cannibals would come into the frame and devour everyone slowly, savoring the tender skin and prolonging death until every last scream had been pulled from each victim. His suspense works though and you turn pages quickly trying to find a way out of impossibly hopeless situations. I won't give any spoilers but just know that nothing is off limits and there are no safety nets with Ketchum. Your stomach will cramp and your soul will ache. I should also mention that it has been a few years since reading this, and it is still vivid in my mind. Jack Ketchum is a tortured soul (no offense to the Hellraiser franchise) and has a tormented mind. While this review is about Off Season, which I enjoyed, but only in an appalling, bloodbath, meat grinder, kind of way, he has written another book that has permanently ruined my life. I will only mention The Girl Next Door here because it is his defining work and I can’t think of his name without association with this book. It isn't classic horror so it didn't fit this week’s topic, but when I have the courage to revisit it in my mind, I will dedicate a review to it. I think of portions of that book years after reading and still cringe and try to shove it from my mind. It truly disturbed my world. For that, Mr. Ketchum, you can go straight to the horned one - fourth ring, fifth pit, second spit, roast slowly. As for Off Season, for shock value and being quite surprised at quality of read and depths of depravity, I give it 4 stars. I've yet to read any Jack Ketchum, but I saw the movie version of The Girl Next Door last year and it was one of the most disturbing, unflinching movies I'd ever seen. I couldn't even really endorse it. Still, I am curious to read some of his work.